I've been asked this question quite a bit lately as I share how it's an essential part of my day, or I wax on about how it is a technology to bio-hack into the exact area of your life you need help, or as I sneak it (not so subtly) into sessions with clients, moon circles, and other workshops. I once had a meditation teacher say that Kundalini simply means "consciousness," or the potential of consciousness that is stored at the base of your spine. I also once read that the word Kundalini can be translated to mean "coil in the hair of the beloved." 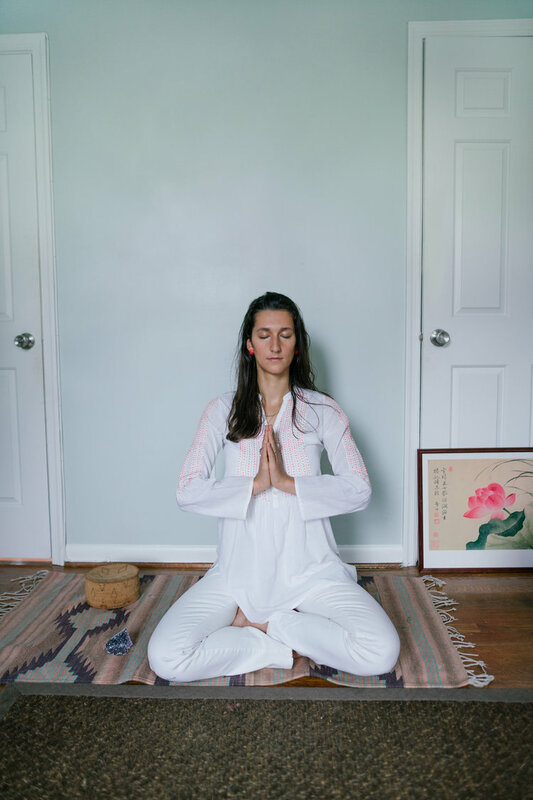 To simplify, as my teacher Guru Jagat describes, Kundalini just mean "energy," and "refers to a storehouse or power that's within all people...and the technology of Kundalini Yoga is the physical, mental, and meditative practices that awaken and utilize that power." In a town where exhaustion is rampant and energy means creativity, vitality, joy, and ultimately a well-lived life, that sounds pretty good right? I fell in love with the practice almost two years ago through Ra Ma TV when I felt a visceral energetic shift in my body. The sets or as they're called "kriyas" were different - unlike Hatha or Vinyasa, and yet left me feeling amplified, as if my wattage was turned up and I was somehow brighter and bigger. It's a feeling I like very much indeed, and it's inspired a consistency that's almost surprising. Kundalini Yoga also, as not-so-secret legend has it, is of a royal yogic lineage. It was kept secret for thousands of years because it was so powerful and was only introduced in the west in the 70s when Yogi Bhajan - the modern master of this Yogic Science and Technology - brought it here, landing quite comically in Beverly Hills and initially teaching a bunch of drugged-out hippie's how to heal themselves and feel an inner reservoir of light, and energy instead of supplementing with chemicals. I've learned through my own practice that Kundalini Yoga is about strengthening the nervous system. Going beyond the strength of the muscles to see how much energy and wattage your system can hold and run through it. How much joy can you circulate? How much can you hold space for really tough stuff too? Ultimately, this is also a practice that allows the glandular system, the endocrine system, and this complex system of hormones to secrete and communicate properly. It does this through very precise exercises, breathwork, and even mantra - or the power of sound to shift frequency and energy. I was attracted to the practice because it kept popping up for me in unexpected places. I've stayed with it because of the inner resilience, energy, beauty, and strength it's lent to my body - from the inside out. I'm beginning to teach it because I want to share the wealth. So if you're curious, you can always learn more digitally from my teacher here, and you're in D.C. and want to give it a whirl in person, I hope you'll join me for the Pop-Ups I'll be teaching Take Care Shop on November 19th, 26th, and December 3rd.